Welcome to Yale Law School (YLS). We’re glad you’re here! During your time at YLS we would like to encourage you to take advantage of our vast resources and knowledgeable staff. Most importantly please remember that if there is anything that you want or need, please ask. Given the nature of our students and faculty there is a good chance that we already have a resource or service that will meet your needs or we can help you find a way to get what you are looking for. Below we highlight the services and resources that we think will make your transition to YLS as smooth as possible. So without further ado, here are the top 6! Our reference staff is knowledgeable, helpful, and accessible by email, phone, and in person. You can find learn more about the law library’s reference services, make an appointment with librarian, and find contact information here. The library web site can direct you to services and tools to help you find what you need to study law and conduct legal research. On the website you can get research help, find databases, learn library policies, and keep up with the latest library and legal research news. The Catalog: The Law Library’s catalog is called MORRIS. You can search MORRIS for books, electronic materials, databases and more. The library has over a million books and access to hundreds of thousands electronic resources, so if you are looking for something you should start with the catalog; chances are we have what you are looking for. ​Note that not everything at Yale is included in MORRIS. To search for material in all Yale University Libraries, including Law, use Quicksearch. Tutorials, Guides, and Classes: The Librarians have created research guides, short videos, and blog posts to help you navigate the important but often tricky world of legal research. These educational resources can be found in the Law Librarian’s Knowledge Base under the FIND tab or by searching the website. Librarians also teach for-credit research courses that you can take in order to improve your research skills or delve deeper into legal research. Please note that course offerings might change. If there is a course that you would like to see us offer, please let us know and we will consider it. Databases: The Law Library and the University offer access to a large number and wide variety of databases. Access to Bloomberg Law, Lexis, and Westlaw is restricted to law students. Each law student will be supplied with an individual password. You will get this password during your library orientation. If you have any questions, please do not hesitate to contact the Reference Desk. 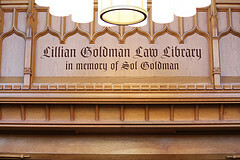 The Law Library also supplies access to a large number of specialized legal databases. The University Library supplies access to many, many more databases. You can search for a database here. ​Off Campus Access: Almost all of the databases that Yale subscribes to regulate access via your IP Address. If you are connecting to the Internet from off-campus, you will have to use the University’s VPN service to gain access to these databases. Instructions on using VPN can be found here. ​MFA (Multifactor Authentication: Yale University now requires MFA to access VPN and all resources from off campus. More information about MFA can be found on the ITS website. Scan on Demand is a free electronic document delivery service that enables members of the Yale Law School community to obtain scanned portions of books or journal articles from the library’s collections. Requests should be made online, directly from our catalog. Requested documents will be scanned and delivered within two business days. We will scan single chapters from books or single articles from journals. This is our ‘signature pajama service,’ designed for wet days: when you just don’t want to go outside, the library will come to you. Deliver on Demand is a natural extension of our Scan on Demand and Interlibrary Loan services – we will mail books to your home (or wherever you need them) when you can’t make it into the library to pick up material in person. Eli Express is a delivery service operating among most of Yale’s libraries. It allows library readers to request that books be delivered from any of Yale’s participating libraries to another Yale library of their choice. You will receive an email when your item is available for pick-up. While searching our MORRIS online catalog, you may occasionally come across items with the location “Lib. Shelving Facility”. This is off-site storage. You can request materials from LSF to be delivered here. It generally takes less than 24 hours, and you will receive an email when your item is available for pick up at the Law Library circulation desk. Use Borrow Direct and Interlibrary Loan if you need material that is not available on the Yale campus. Borrow Direct is a service that can be used to borrow books from other libraries. Most books borrowed through Borrow Direct are available for pickup at the Law Library within four business days. A link to Borrow Direct can be found here. If the book you want is not available from Borrow Direct, or if you need it for an extended period of time, you should use Interlibrary Loan. Request forms may be submitted through the Web. In an effort to improve our customer service to everyone, we no longer allow library patrons to place recalls on material checked out from the law library. Instead, we are encouraging our patrons to use Borrow Direct. If the material you are looking for is not available via Borrow Direct, contact a staff member, and we’ll be happy to obtain the material.